CASE STUDY: How Yatra.com became the leading online travel portal in India? Home > Blog > Blog > CASE STUDY: How Yatra.com became the leading online travel portal in India? When Dhruv Shringi was fired as COO of ebookers in London in June 2005, no one imagined he would go on to set up India’s leading online travel agency Yatra.com. Yatra.com is India’s leading Online Travel Portal offering solutions for all your travel needs. From air tickets to hotel rooms to holiday packages to buses to car rentals, yatra.com has everything for its customers. Yatra.com based in Gurgaon, started with 3 members in 2006 that rose to 700 in 2008 and 1000+ in 2016. Yatra.com provides reservation facility for more than 50,176 hotels in India and over 500,000 hotels around the world. The portal has reached to such a height that the company is doing 20,000 domestic tickets and 7500 hotels and holiday packages a day. While Dhruv, Manish and Sabina were working with ebookers during the year 2000-05, online travel industry was growing with pace. It was then when the trio learnt about the online travel industry. They decided to do something of their own and after a lot of brainstorming; they started with the process of Yatra.com. 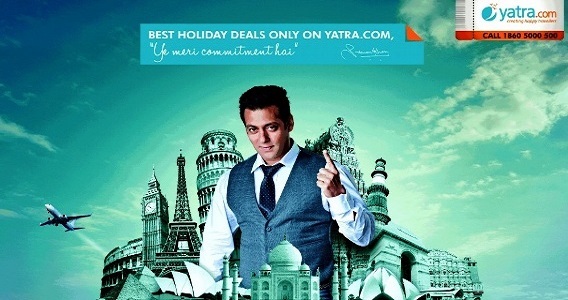 Yatra.com provides an access to the best travel deals across numerous national and international destinations. It is among leading aggregator of hotels in India. Yatra.com provides reservation for 50, 176 hotels across 500+ destinations in India as well as 430,000 hotels worldwide. The brand has reached the height of trust by its customers and till date it has more than 31,538,129 happy travelers. Currently Yatra.com is doing average revenue of Rs 100 crores a month and a volume of more than 6,500 air tickets and 300+ hotel room nights per day. Today, more than 80% bookings comes from online media like computer or mobile browser or apps and other 20% comes from call centers. With booking of more than 20,000 domestic tickets and 5,000 hotels per day, Yatra.com has achieved a huge success in his journey till now. Yatra in its initial timespan used Print media as a method of advertisement. Soon people started knowing about the services of the company and then Yatra it moved on to TV advertisement and endorsed Boman Irani as its brand ambassador. In the year 2012, it endorsed Salman Khan as its brand ambassador. It helped the company in many ways and in short it increased the customer base for the company. Side by side, Yatra also performed online marketing using different marketing strategy like google AdWords that helped the company grow rapidly. Bollywood actor Salman Khan is the brand ambassador as well as a shareholder in the company. Earlier, Bollywood actor Boman Irani has also been the brand ambassador for Yatra.com online flight booking services. In April 2014, Yatra.com announced to be the Official Travel Partner of IPL Team Rajasthan Royals. Yatra.com started a Facebook Page around the “Happy Travelers” theme. It included the pictures of the happy customers of Yatra. The brand also ran Facebook Ads to create its loyal fan base. Yatra engaged with its fans through its Facebook Page by timely responding to their queries, posting special offers and promotions on the Page and hosting apps like the “Happy Travel Jigsaw” where fans can solve puzzles. As a result of the targeted Facebook ad campaign, Yatra generated INR 1.5 million/month only from Facebook advertisement.